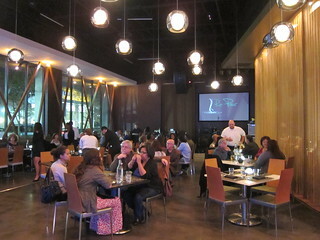 I wouldn't normally consider going to Rancho Cucamonga to dine, but the promise of a free hotel stay sounded like a nice getaway and convinced me to go check out this new restaurant headed by Executive Chef Greg Stillman, a French Laundry and Patina alum. On the drive to the restaurant, we saw what other places were in Rancho Cucamonga and it was pretty much restaurant chain capital. 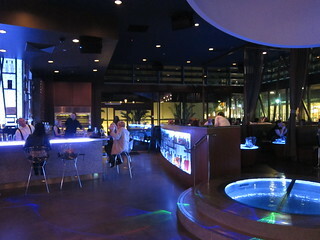 Ra Pour is located inside the Victoria Gardens outdoor mall. The restaurant is large and a divider separates a large table facing the kitchen - a semi-private "chef's table"
The other side of the restaurant was the lounge area - even the lighting was different. Apparently after regular dinner hours the place turns into a club with DJs - not really my kind of scene. 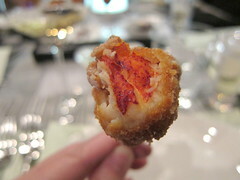 The pops had actual chunks of lobster inside, not shredded and mixed. I tried the tempura mushrooms but didn't realize it had a dipping sauce which didn't make it to my side of the table at the same time, so it was incomplete. The cocktail list contains five "signature cocktails" at $14 each and five "vintage cocktails" at $12 each. I went with one from the vintage list, the Highlander with Famous Grouse blended scotch whiskey, fresh grapefruit juice, house made grenadine, clover honey, orange bitters. 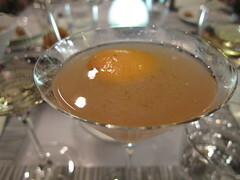 I tried my friends' "signature cocktails" which lean towards the sweeter side. It was only a few years ago that I started getting into beer, and I'm still not one for IPAs. Still, I know that Stone beers are supposed to be great. Not long ago, Sammy's Woodfired Pizza and Grill in El Segundo sent out a dinner invitation, paired with Stone beers. I figured I would probably enjoy IPAs much better when it's paired with proper food, especially when the promised food included lobster mac and cheese. Sammy's Woodfired Pizza has many locations in California (and some in Nevada), but the newest El Segundo location is the first one that also has a grill. This makes it the best location, since it has awesome, inexpensive grilled lamb chops! More on that later. 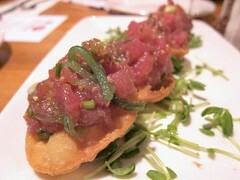 It's a pretty nice poke dominated by the flavors of the sesame oil (no complaint). I like the unusually puffy wonton crisp. Lobster Mac and Cheese with Tillamook® cheddar cheese ($9), made with real lobster chunks, and lobster bisque as a base. Real lobster chunks for a hot, cheesy, $9 bowl? Yep, and it's a good sized bowl, too! The added lobster bisque made for a nice flavor base, as well. 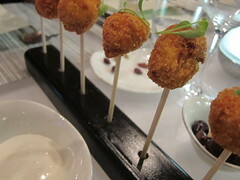 Joining us for dinner was Stone's sales rep for the LA region who explained to us the reasoning behind each pairing. 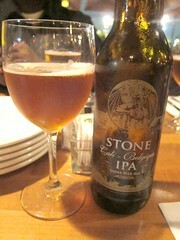 The above two dishes were paired with Stone Cali-Belgique IPA, 6.9% ABV. This was a beer made using Stone IPA as a starter and Belgian yeast. It was not too bitter and well balanced. It brings out the spiciness of the poke. 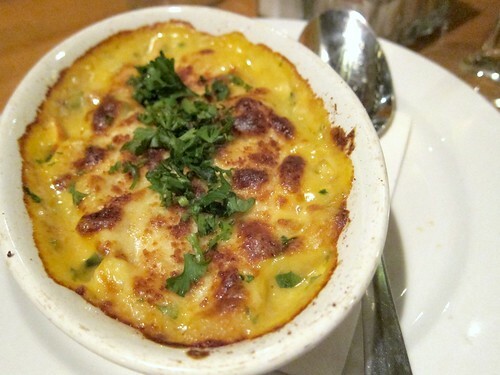 For the mac and cheese, the hops and the cheese balance each other nicely and the dry finish cuts the richness. As far as IPAs go, I can easily drink this even without food.